On January 15, 2008, the Library received a call from Mr. Ivo Stipinovich informing us that his aunt had passed away and it was her wish that we receive as a donation the records of The Association of Pioneer Women of California, of which she had been the last president. His aunt, Lorna Clair Stipinovich, had also been a member of The Society of California Pioneers as well as a past president of The Daughters of California Pioneers before that. The Librarian told Mr. Stipinovich that we would be happy to accept the donation, knowing that the Association, founded in 1900, was one of the earlier organizations for female descendants of early Gold Rush pioneers. The Librarian asked how many boxes comprised the collection, and he told her to walk over to the window of the Library’s reading room, and look across the street at the stoplight. She did so and saw him standing across the street, at the stoplight, carrying a large book under his arm, and pulling a “steamer” trunk behind him. He was invited in and we found the collection to be comprised of not only a cloth-bound book or ledger in which were written accounts of member’s trips to California, but also (in the “steamer trunk”) records of the Association. 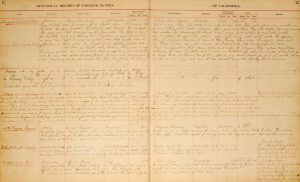 These records included bylaws, business receipts, minutes, as well as plans and drawings for the Log Cabin they designed and built in Golden Gate Park -where their meetings were held and which still stands. 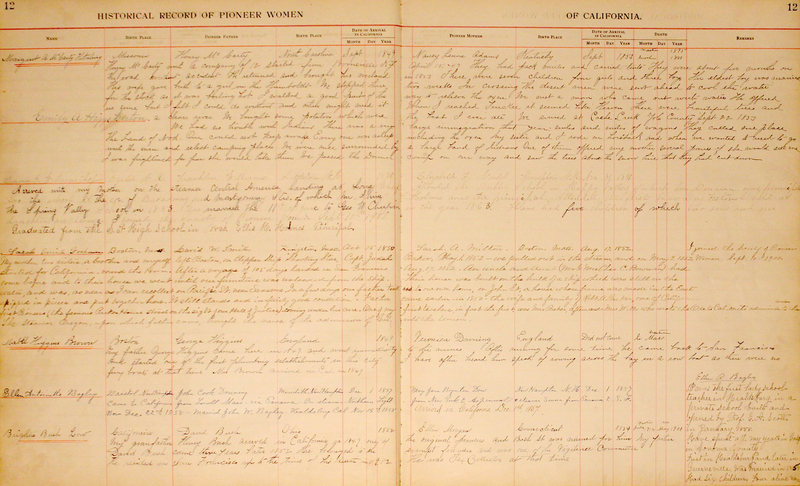 The Association’s book of women’s accounts of their trips to California and their early lives there continues to be an invaluable resource for not only its listing of their early members, but also birth dates, their father’s and mother’s birthplace and arrival date in California, and often a date of their death. The entire collection is a unique and significant addition to the state’s history of early women Pioneers, and The Society of California Pioneers is fortunate and honored to be housing this collection and making it available to researchers.